Wall Pads from Greatmats provide a layer of protection in schools and universities. We carry wall pads that are wood backed and vinyl wrapped. These pads are available in various installation types including direct wall attachment and Z-clip installations. Greatmats also offers custom designed wall pads for larger scale installations. Pads can be designed to work around windows, doors, wall cutouts, and light or fire switches. We also carry custom column pads and pole pads for gyms or athletic facilities that have i-beams or other support structures along the walls. Our colorful, panelized gym wall pads will bring your gym to life. At Greatmats, we can add your logo, team name, mascot, or any other image across your wall pads. Bold and colorful, they will brighten your walls and fill your gymnasium with school spirit. These custom gym wall padding provide pro-caliber safety and protection for your high school or university gyms. They are solid, wood-backed, vinyl-wrapped gym wall pads. We offer these products in a variety of custom sizes and thicknesses. A standard gym wall pad is a 2 inch thick, cross-linked polyethylene foam wrapped in a durable 14 oz. vinyl cover. These are the same standard wall mats you will find in major universities across the country and around the world. Gym wall padding comes in a variety of thicknesses, colors, and sizes so you are sure to find exactly what you’re looking for. These pads are perfect for walls behind basketball hoops, in wrestling rooms, and on the walls of any facility where you want to show off your school spirit. Digital printing is also available so you can get the highest quality graphics available on your wall padding for gyms. If your gym is like countless others, you will probably find you have unique challenges to work around with your wall pads. Wall outlets, light switches, and other areas need to be accessible even after the wall pads are mounted. At Greatmats, we can help accommodate you with these unique needs. Our wall pads can be custom designed around your particular obstacles so that they attach perfectly while still leaving exposed the things you need accessible. We can even custom pad your gym doors around the handles and windows. Our wall pads will arrive with all necessary hardware included. No additional hardware will be required to install the pads. 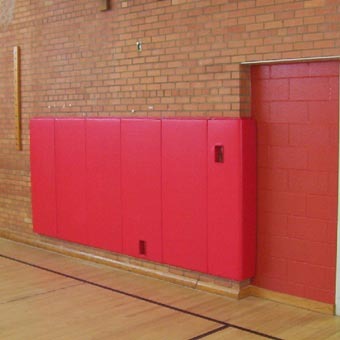 Our wall padding for gymnasiums can be directly attached to concrete block walls or wooden studs. Upper and lower lip options are available so that you can easily replace and repair vinyl as needed. Each wall pad panel is Class A rated for fire resistance. We also offer a heavy duty vinyl upgrade to 19 oz for excessive abuse. An outdoor mat is available with UV protection against the sun and an 18 oz. vinyl cover. These mats feature a 30 oz foam and a moisture-resistant composite wood backing. Our wall pads come in various installation types including direct wall attachment and Z-clip installations. You can also opt for a hook and loop attachment option. This allows you to take the pads from the wall and use them as folding gym mats on the floor. Greatmats also provides these pads custom designed to work around windows, doors, wall cutouts, and electrical switches. Column and pole pads are also available. Column wall pads are available in the same colors and vinyl thicknesses as our standard wall pads. We can have the perfect sizes and shapes cut to fit to your specs for any random obstacle that your gym features. Wood-backed and built of high quality foam and a thick vinyl, our custom column pads are sure to last for years to come even under the challenging environs of gymnasiums. They are bright and colorful and look great in athletic facilities of all types.